Every week, from Oct. 3, 1964 to Oct. 2, 1965, John O'Hara wrote a syndicated column. His contract ran for one year and was not renewed; he wouldn't take a pay cut and the syndicate wasn't making enough money out of him. Reading the collected columns explains why. 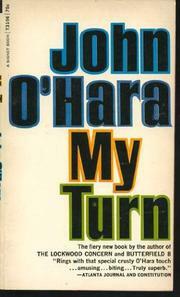 O'Hara is not about to adopt any Dale Carnegie stance to woo agreement. He warned his readership of this right from the start and proved it in the second column, in which he said that the anti-cigarette advertising was getting as ridiculous as the hard sell tobacco commercials had been. Later, he looked into the Community Chest and didn't like what he found. He does admire de Gaulle, but the Kennedy family not at all. Prince Philip's occupational grousing annoyed him. He laughed at Lady Bird's trial flight as a literary critic. He didn't care for either Edward R. Murrow or Adlai Stevenson in life and saw no reason to change his mind when they died. He felt that on at least one occasion, Martin Luther King got way out of line. O'Hara squabbled vigorously and personally all over a full range of irritations. Some of his critics found him arrogant and captious in roughing up other brand name authors. He needles Liberals unmercifully and thumps the Republican tub. But he did have a readership some delighted, and others who read him to feel their blood pressure rise it hasn't since Westbrook Pegler stopped ranting, and this is The Compleat Curmudgeon in print.